The play begins sometime in the late 1520s with a conversation between Thomas More and his friend Richard Rich. More dislikes bribes and being in the public eye, whereas Rich cannot wait to increase his social status from his current position as a poor academic. More helps Rich by connecting him to his friend, the Duke of Norfolk, who takes Rich under his wing and hires him as an assistant. More goes to meet with Cardinal Wolsey, the Lord Chancellor of England. Wolsey wants More’s help writing a letter to the Pope asking him to annul King Henry VIII’s marriage to Catherine of Aragon. More resists, and Wolsey warns him that as a statesman his private conscience and moral objections should not be more important than the fate of the country. Although More’s objection is moral, people are already beginning to think his protest is political, like Chapuys, who assumes More’s silence means he has allied himself with Catherine, and by extension, Spain. Back at home, More deals with his daughter Margaret’s suitor, Will Roper. More likes Roper, but thinks his morals are too changeable, even calling him a “heretic.” He eventually softens to Will, whose politics become more moderate, allowing Will and Margaret to marry. Some time later, in 1530, Wolsey dies, and More is appointed the Lord Chancellor. Thomas Cromwell, a lawyer and a confidant of the King, is becoming suspicious of More. Although he is in an even more public position than before, More has still refused to publicly acknowledge the King’s divorce. Cromwell bribes More’s Steward as well as Richard Rich to try to find incriminating information he can use to bribe More. The King comes to visit More in his home, and attempts to convince him to validate the divorce. Henry is upset because he feels that, without More’s approval, his religious standing and soul are in jeopardy. More remains unchanged, and the King leaves abruptly and angrily. Henry expresses his frustration to Cromwell, who, together with Rich, plots to find a way to punish More, or convince him to change his mind. Parliament passes the Act of Supremacy which establishes Henry’s right to split from the Catholic Church as leader of a separate Church of England, but More will not sign it. Increasingly, people take his silence to mean he does not support the King at all, which is not the case. More’s family and friends attempt to convince him to change his mind, but he will not. As the pressure increases he becomes increasingly committed to his conscience. He resigns from his role as Chancellor, but continues to be persecuted by Cromwell and the King. More is eventually imprisoned, although he has not been charged with anything. Cromwell and Rich visit and attempt to get him to take an oath acknowledging the Act of Supremacy. His family also visits and begs him to relent. More does not, and is brought to trial. During the trial Rich lies under oath and says More denied the King’s title as Supreme head of the Church of England. This was not true—More never denied the title, he just refused to endorse it. Unfortunately, the jury finds him guilty of treason without deliberation, and in 1535 More is executed. Sanders-Schneider, Ivy. 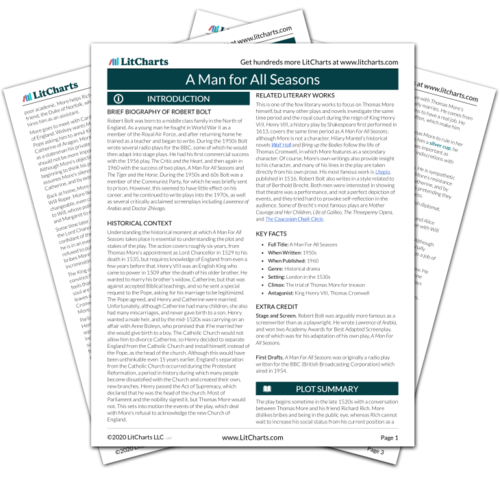 "A Man for All Seasons Plot Summary." LitCharts. LitCharts LLC, 17 Oct 2017. Web. 21 Apr 2019. Sanders-Schneider, Ivy. "A Man for All Seasons Plot Summary." LitCharts LLC, October 17, 2017. Retrieved April 21, 2019. https://www.litcharts.com/lit/a-man-for-all-seasons/summary.